What Are Durable POAs Used for? 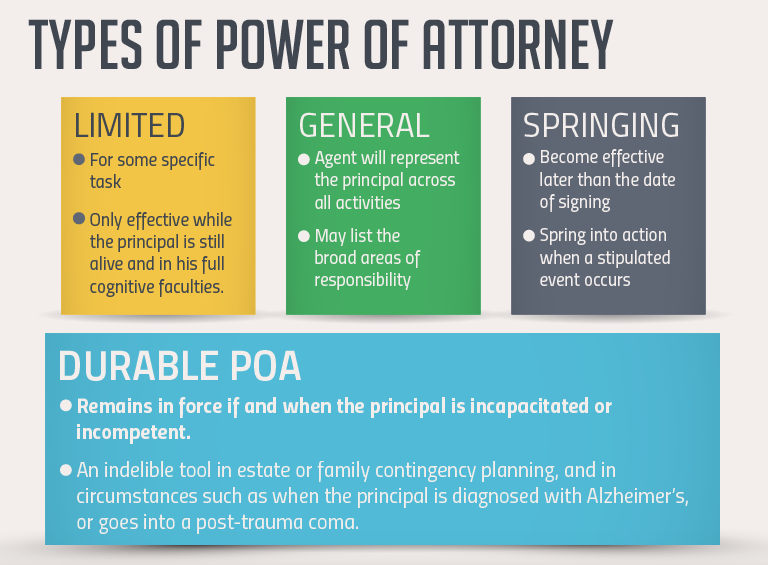 A durable power of attorney (POA) is a legal document that empowers the agent to act on behalf of the principal. It remains in force if and when the principal is incapacitated. The agent has to proffer the responsibilities listed in the POA document to ensure the principal’s interests are best served. 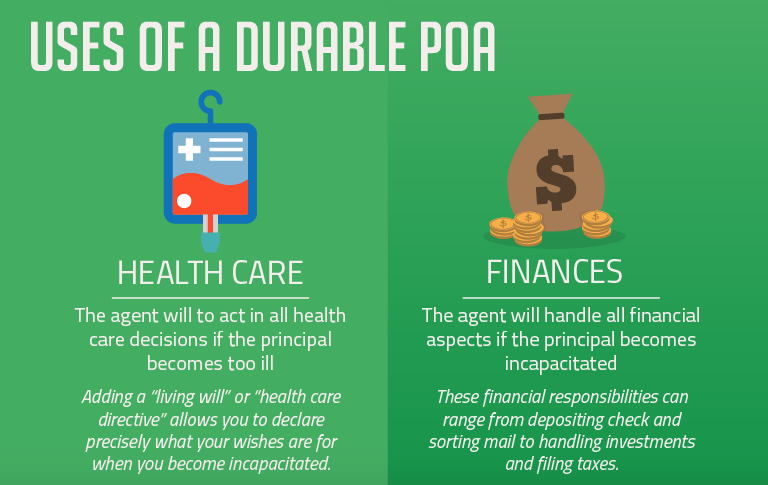 There are two main kinds of durable POA: Healthcare (the agent will be responsible for all healthcare decisions) and Finances (the agent will handle all financial aspects). The living will is a tool to describe your health care requirements after you become cognitively impaired. It is important to have comprehensive contingency plans if you are the responsible party for an elderly loved one. A power of attorney is a legal document that empowers someone else, known as the agent (or the attorney-in-fact), to act on behalf of the instigator of the POA (the principal) either in broadly defined matters (a general POA), or in defined circumstances (a limited POA). The agent need not necessarily be an attorney, for he or she can be anyone of the principal’s choosing. In a limited power of attorney, you can name someone to act on your behalf, for example for the sale of a property, to sign a contract, or for some other specific task. The agent can only represent you within the scope of that transaction, and only while you are alive and in your full cognitive faculties. When that task is completed, or upon your passing, the attorney-in-fact relationship comes to an end, and the agent you appointed ceases to represent you. In a general power of attorney, although the scope of what you want your agent to represent you in is across almost all activities, a good attorney crafting the POA document will still want to list the areas that the POA was particularly intended for, except that those areas are given the broadest of definitions. That listing adds to the voracity of the POA document in case it is contested in a court. The durable power of attorney is more or less the same as the regular POA, the main exception being that it remains in force if and when you are incapacitated. That “durability” component makes it an indelible tool in estate or family contingency planning. If your durable POA is in the realm of managing your financial affairs, the agent you assign can keep administering your finances when you are incapacitated. When you regain your ability to manage your own finances, or at the time of your passing, the POA relationship again comes to an end. Because regular POAs come to an end if the principal becomes incapacitated or incompetent, they become useless in certain circumstances, for example if the principal is diagnosed with Alzheimer’s, or goes into a post-trauma coma. The durable power of attorney has specific wording that spells out that it would remain in effect if and when the principal becomes incompetent. 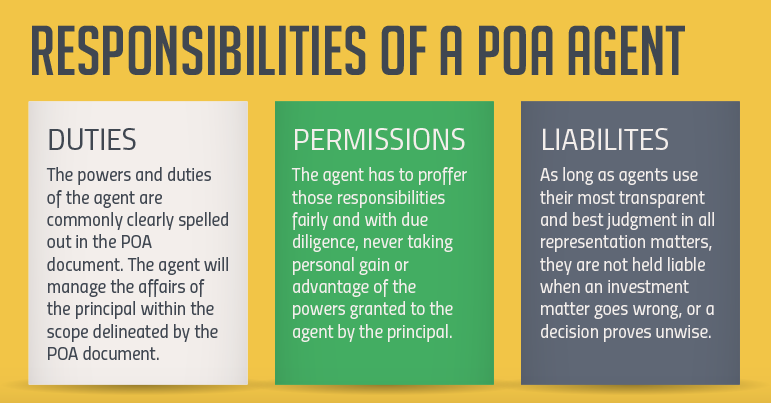 The powers and duties of the agent or attorney-in-fact are usually clearly spelled out in the POA document. There are also legal protocols that govern the agent’s responsibilities, defining for the most part what the agent can and cannot do. The agent acts in a fiduciary capacity, i.e. to manage the affairs of the principal within the scope delineated by the POA document. The agent has to proffer those responsibilities fairly and with due diligence, never taking personal gain or advantage of the powers granted to the agent by the principal. As long as agents use their most transparent and best judgment in all representation matters, they are not held liable when an investment matter goes wrong, or a decision proves unwise. Another unwritten rule in that regard has it that in managing the principal’s investments, and for the sake of prudency, the agent will diversify such investments, thus minimizing the potential for loss. The law that governs these ethical issues is thus a test of honest conduct and does not hold agents liable for poor results. In managing the principal’s affairs, when agents come across areas where they do not have particular expertise, it is incumbent upon them to seek advice from others who do. Once again, it all comes down to serving the principal’s best interests. A Power of Attorney becomes effective the moment it is signed unless it is specified in the POA document that it becomes effective at a later date or when some triggering factor occurs. Such POAs that depend on a future trigger are called “springing” POAs, as they spring into action when a stipulated event actually occurs. When the springing event happens, it is incumbent on the agent to inform any third parties involved that the agent now represents the principal in the affairs at hand. This is usually done in writing, attaching a copy of the POA. When the agent becomes a signatory on a certain matter, it is incumbent on the agent to make it clear on the document to be signed that they are not acting on their own behalf, but on behalf of the principal. A “medical power of attorney” is commonly known as a durable power of attorney for health care. Such a medical power of attorney transfers the authority to deal in all health care issues from the instigator of the POA to the agent or attorney-in-fact when the principal becomes too ill or otherwise injured or indisposed to have the mental capacity to act on their own behalf. Depending on the state where the principal lives, the agent or attorney-in-fact may also be referred to as a “health care proxy”, “health care surrogate”, or other appellations to that effect. In crafting a durable power of attorney for health care, you set out your health care preferences for such a time as you may get disabled, i.e. the type of medical care you wish to receive when you can no longer make those decisions. Upon arranging for your care, your agent advises all doctors and medical providers caring for you firstly that they represent you, and further what specific services you have empowered them to request on your behalf. For you to ensure that your wishes are clear, you may use what is referred to as a “living will” or “health care directive”, a document that sets out in writing precisely what your wishes are for when you become incapacitated. 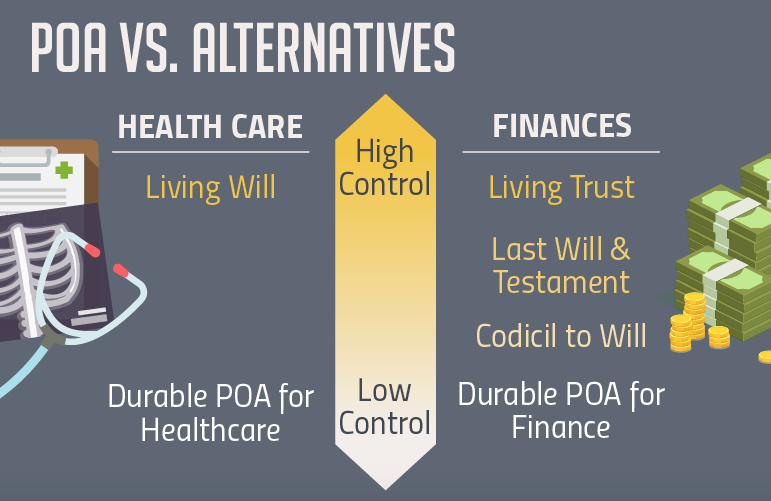 In many states, the two documents (durable power of attorney and living will) can be combined into one legal type of POA known as the “advance health care directive” (more on this below). Can I change my mind about my durable POA for Health Care? or Can I revoke a durable POA? Yes. If you change your mind, you should destroy the copy of the form that you have and tell anyone who might have a copy that you have changed your mind. You can then make a new Durable Power of Attorney for Health Care that reflects your current wishes. You should be aware that if you get married after you have signed a Durable Power of Attorney for Health Care, it will be automatically revoked (not legally valid) unless you have named your new spouse as your agent. Is a durable POA an alternative to a guardianship after you become mentally incapacitated? A Durable Power of Attorney is an alternative to guardianship only if it is given before you become mentally incapacitated. To give a Power of Attorney, you must have the mental capacity to understand what you are doing. 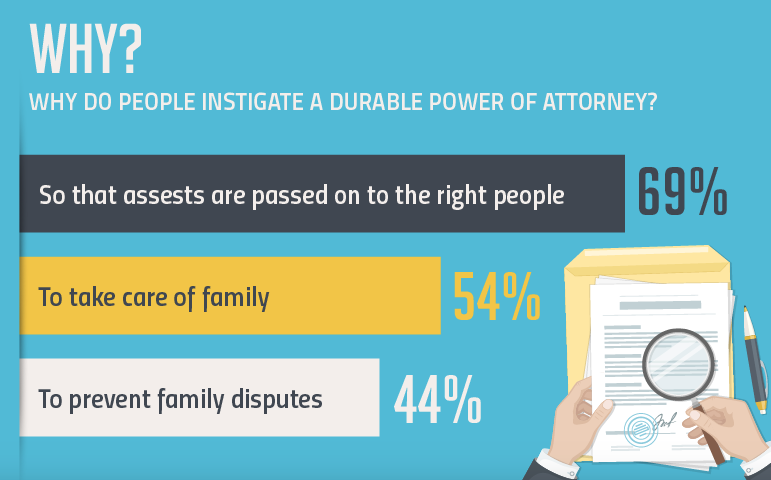 Once you have lost that capacity, it is too late for you to give a Power of Attorney. At that point, a court will have to appoint a guardian or conservator for you, if there is a need. Unlike a limited power of attorney in which you give your agent authority to execute a specific transaction on your behalf, such as selling a property or depositing your social security checks, a “financial power of attorney” has a much broader scope: it transfers authority to your attorney-in-fact to handle all financial matters on your behalf if you become incapacitated. This is referred to as a “durable power of attorney for finances”. From simple tasks, such as depositing checks for you or sorting out your mail, to the more demanding responsibilities of managing your overall investments or filing your tax returns, you can spell out specific directives in a durable power of attorney for finances, and your appointed attorney-in-fact can be simply a trusted family member or friend. Living wills are to be differentiated from the standard will or “living trust” ordinarily left for determining the disposition of investments, estates and trusts. The living will you endorse is specifically intended as a tool to describe your health care requirements after you become cognitively impaired. In your living will, you can say as much or as little as you wish by leaving clear instructions regarding your post-impairment medical preferences. It’s your will, and it gives you considerable flexibility and a variety of options. If you have the opportunity, it is helpful to seek further advice on any or all of the above options from your primary care physician, oncologist, or hospital representative. If you want your end of life to proceed naturally, meaning without life-prolonging processes, you may still want to mitigate your pain and endure your last days in relative comfort. That is where palliative care becomes a vital aid. To “palliate” means to relieve or alleviate (symptoms) without offering cures. Today, at more than 1700 hospitals across the nation, palliative care provides individuals with chronic or life-threatening illnesses a proactive and concerted type of care that aims at mitigating some of the pain and suffering caused by their illness and thereby improving their quality of life. 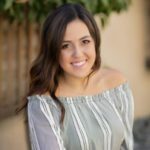 Although it is not a prerequisite for introducing palliative care to a patient, by enhancing quality of life and adding psychological and spiritual aspects of care, palliative care is considered a holistic approach that has the potential for positively affecting the progression of the patient’s illness. Are power of attorney documents public record? Unless you specify that life-prolonging methods are to be withheld, doctors may intravenously, or via tube feeding, administer food and hydration to keep your brain, organs and other systems functioning. Tube feeding is the mechanism used for the long-term administration of nutrients and fluids. It is realistic to keep in mind that people can be kept alive for years while in comas by tube feeding. By contrast, without hydration in particular, the body will give up in a matter of days. The decision as to whether you want food and water to be provided or withheld is one of the toughest issues to contemplate, although it is important to keep in mind that as long as you remain alert and able to communicate, food and water will not be withheld. Many people, particularly those in Hospice programs or in the final days of critical illnesses, choose to direct the medical teams that care for them, once death is near, to withhold all life-prolonging methods. The most common tool for those kinds of instructions is known as a do not resuscitate (DNR) order when someone is in a hospital. If the person is at home, the order is called a “pre-hospital DNR” order; it alerts paramedics who may come to the person’s home to abide by the order. A medic-alert type of bracelet or necklace can also be used for home-based emergencies. In some states, regular DNR orders are being replaced by what is known as “Physicians Orders for Life-Sustaining Treatment” (POLST). These offer the instigator of such a directive as well as their medical teams the opportunity to add options to do with intubation, the use of antibiotics, or feeding tubes. Once again, it is helpful to seek professional help from the medical community when devising end of life instructions. Durable powers of attorney for health care usually come to an end when the medical team overseeing your care make the final dispositions regarding what to include and what to withhold. The exception to that has to do with how you want your body disposed of after death, whether by cremation or normal burial. In addition, your health care directives in many states can include whether you want to authorize an autopsy or donate some organs or your entire body. Issuing a power of attorney for health care need not be all-encompassing. You can restrict it in several ways, but also simply by specifying what you want included or omitted. And, keeping in mind that your agent springs into action only when you become incapacitated, you can keep adjusting your directives until the end, although that may not be the most practical way of going about it. The simplest way to limit your agent’s scope is to empower your agent to do only what is specified in your living will, and not on other medical issues. It behooves you however to think clearly about those matters, for once you are incapacitated, your agent may be asked to provide direction on options that you had not foreseen. Seeking help in these issues can broaden your understanding of what may or may not occur once you are not able to manage matters on your own behalf. Anyone who has spent years in geriatrics or in elder care knows that there are families that have comprehensive contingency plans in place, and others that never got down to tying up those loose ends. The former group knows the value of preparing for the many trigger events that can send family members into a tizzy, while the other group will face the inevitable unprepared. We don’t often ponder what would happen to the rest of our loved ones if we, suddenly or following a protracted illness, succumbed to death. If you’re like most people, you don’t exactly relish thoughts of that nature, or the task of perusing the paperwork and other preparations that need to be taken care of towards your end of life responsibilities. 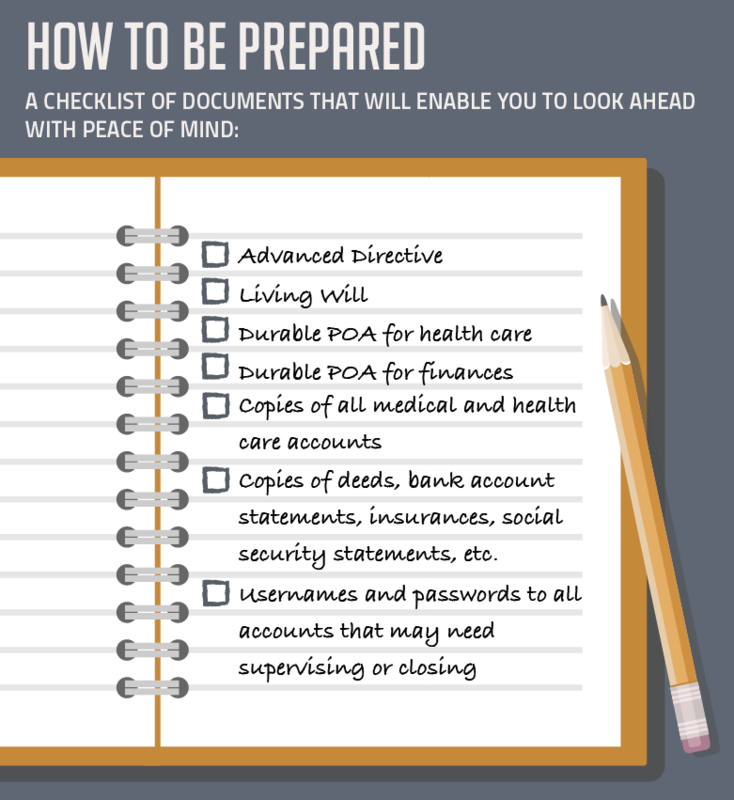 With these documents in hand, you and the rest of your family will be more prepared to face the unknowable. Dealing with a loved one’s illness or a sudden health emergency can be overwhelming and emotional. Having the foresight to be prepared will help take some of the load off later in these difficult situations.